In today's busy world, it can be difficult for a father to find enough free time to spend with his kids. Between work, school, extracurricular activities and friends, it can feel like there's always someone running out the front door. However, you may want to do your best to make time for regular family meals, as they can be instrumental to your children's growth and development. Here are just a few reasons why you should continually gather your family together around a table filled with food. Substance abuse can be a serious issue for today's kids, but regularly sitting down for a family meal has been shown to cut the likelihood that your kids will experiment with alcohol or tobacco. The same goes for illicit drugs like marijuana. It is for this reason that Family Day – A Day to Eat Dinner with Your Children™ – was established by the National Center for Addiction and Substance Abuse at Columbia University in 2001. This annual event takes place every fourth Monday in September, and has garnered praise from President Barack Obama for its efforts. It should come as little surprise that in today's junk food-obsessed world, it's becoming harder to get kids to eat nutritious meals. However, sitting down for breakfast, lunch or dinner together can increase the amounts of fruit, vegetables, whole grains and lean meats children eat as well as more controlled portions. 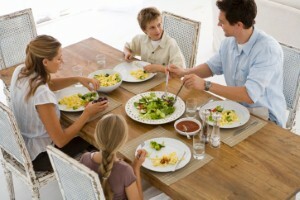 While many parents may feel like they've fallen out of touch with their kids as they grow older – particularly teenagers – family meals are the perfect time to reconnect. Even sitting down for a half-hour dinner can spark conversations about relationships, friends, classwork, extracurricular activities, college plans and a variety of other important subjects.